You may have heard of the Tour de France, but have you heard of the Tour de Shul? In a certain sense, the past ten months have sent me on a journey throughout the majority of the synagogues throughout Orange County. It has been a true blessing to have all of these experiences, no matter how they once began. Great opportunity has come from an initially troubling situation—and there isn’t anything more Jewish than that! On one hand–there is no doubt that since our fire, we have learned that TBS is so much more than a building. We are a community and we exist wherever we have gathered, no matter the number of people or the cause for the occasion. While, on the other hand, the opportunities that have literally risen out of the fire have been amazing, eye-opening, and soul-nurturing. We were handed the ability to rise above this situation, and we have and continued to be welcomed into so many of the neighboring communities which surround us. We find ourselves regularly welcomed with warmth and open arms by the LDS community, who are literally our closest neighbors in the surrounding neighborhoods of the temple. We have also had the opportunity to share services with Congregations B’nai Tzedek, Shir Hama’alot, and B’nai Israel. Each of these times, our shared worship has been something exceptionally special and, moreover, bonding. Additionally, we have been welcomed in to use the sacred spaces of Temple Bat Yahm and University Synagogue for our b’nei mitzvah services, as well as the Chapman University Fish Interfaith Chapel, which adorns us every time with its stunning architecture and perfect acoustics. I feel like I have been given an amazing opportunity to experience worship in these new spaces, each which brings its own touch to our experiences within. This is something with which our committee working on rebuilding our own sanctuary is incredibly aware of and cognizant in each of their decisions. While our community will continue to exist and thrive within and beyond our walls, the experiences we have within our own sacred spaces are naturally shaped by their existence. Over the past ten months, I have received a rare gift in this ongoing opportunity to experience prayer in multiple locations. 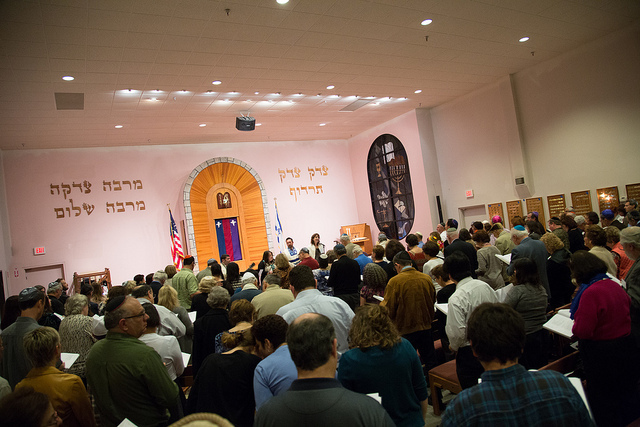 We clergy do not often get to travel regularly to other synagogues to worship with their community. Thus, it is a gift to be able to take these moments and then build upon them as we bring back the things we love, as well as the new insights and the new ideas we receive. We have so much to show for 2014. Despite our challenges, nothing ever set us back, we accomplished so much, and I am so ever grateful to my fellow staff and to all of you—our caring and dedicated TBS family. As I think about our year of 2015 ahead, I am filled with feelings of hope–with great prospect for the future, knowing that this will be a year of a continued journey, but we are on our way to an incredibly exciting and bright new beginning.